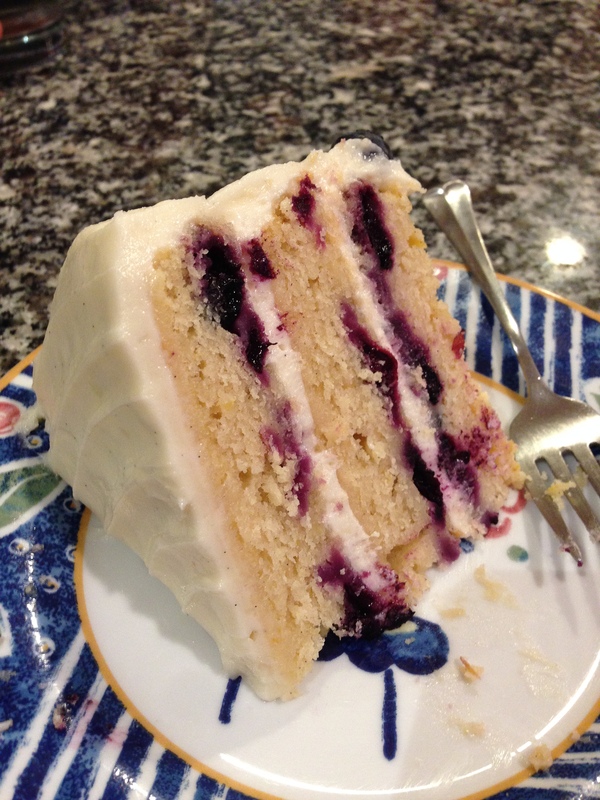 I tried something different and more summery for the 4th of July with this lemon blueberry cake would qualify. I’ve wanted to make this particular cake for some time, but you do what you can when you are catering to an audience that likes mostly desserts related to chocolate and strawberries. I’m continuing to work on my cake decorating skills. I got a number of comments on this cake specific to its decoration, so there’s that. I kind of liked the simplicity of the swirl on top with the ring of blueberries on the bottom. Surprisingly (to me), the cake got rave reviews from everyone. Even my wife, the chocoholic, really enjoyed it and said that it tasted very similar to the lemon raspberry cheesecake at The Cheesecake Factory if the blueberries were raspberries instead, so I will likely try this one again with raspberries. I’ll probably make a few other changes, too. I thought that my recipe for cream cheese frosting is better, though, admittedly, the frosting is not the highlight of the cake. Structurally, I think my frosting holds up better, but this could have been a result of the warmer temperature. Even though I folded in the blueberries carefully after tossing them with flour, the blueberries sank to the bottom because I dropped the pans on the counter to release air bubbles (probably completely unnecessary). I won’t do this next time. Wash the blueberries and pat dry. Set aside to dry further. Toss blueberries in 1 tablespoon flour to coat, then fold blueberries into the batter. Pour batter into cake pans (~616 g per cake), but do not tap cake pans (blueberries will sink to the bottom). Bake for 25-30 minutes or until toothpick inserted into the center comes out clean. Allow cakes to cool for 10 minutes, then flip onto wire rack to cool completely. For the frosting: Beat cream cheese and butter in stand mixer on medium speed for about three minutes. Add powdered sugar, vanilla, and salt, mixing on low speed until combined. Mix on high speed for three minutes.